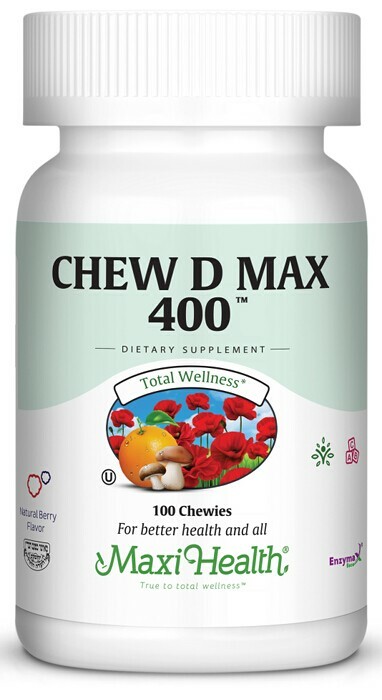 Chew D Max 400™ is a 400 IU delicious chewable, berry flavored tablet. It's your logical choice for vitamin D supplementation. It's your logical choice for vitamin D supplementation. It supports calcium absorption in the gut and the mineralization of bones. It also supports modulation of neuromuscular control and reduction of inflammation. Chew D Max 400™ is made with vitamin D3, the most absorbable form of vitamin d. That’s why vitamin D3 is preferred over vitamin D2. Try delicious berry flavored Chew D Max 400™ to support your health. Take one (1) tablet daily, or as directed by a healthcare professional. Other Ingredients: Sorbitol, microcrystalline cellulose, vegetable stearine, maltodextrin, magnesium stearate, Enzymax® (calcium carbonate, bromelain, papain, lipase, amylase, protease, silica), beet juice powder (for color), silicon dioxide, and natural berry flavor. This product contains no soy, gluten, wheat, salt, milk, yeast, artificial flavors, colorings or preservatives. My daughter of 6 years old had serious eczema on her back and knees. Someone recommended that I give her Maxi Health Chew-D-Max-400. After a few weeks the eczema disappeared! The Chew D 400 is smaller than your regular chewable, which is fantastic, and it breaks down very easily when you chew it (not hard like some others).